People use energy for transportation, cooking, heating and cooling rooms, manufacturing, lighting, entertainment, and many other uses. The choices people make about how they use energy—turning machines off when they're not using them or choosing to buy fuel-efficient vehicles and energy-efficient appliances affect the environment and people's lives. Energy efficiency is using technology that requires less energy to perform the same function. Using a light-emitting diode (LED) light bulb or a compact fluorescent light (CFL) bulb that requires less energy than an incandescent light bulb to produce the same amount of light is an example of energy efficiency. 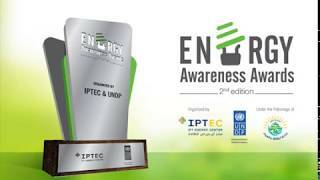 * If you are a private sector institution, a university or technical school, a youth innovation and entrepreneurship, or a municipality, and have successfully implemented a project that contributes in reaching energy efficiency and conservation, click here to apply before June 15 to the second edition of the Energy Awareness Awards (EAA 2019) for a chance to be recognized and awarded.